Welcome to Little Diva Bowtique, LLC! - Home Remember, you can mix and match any clip with any hat or headband! We will customize anything! Just ask. Mention this and you will receive a FREE clip with a $20 purchase!! Come see Little Diva at it's newest location at In Motion Dance Studio in Plymouth for all of your tutu and leotard needs! We are now at Exchange Bank Coffeehouse in Plymouth and Inn Motion Dance Studio in Plymouth. A flower for you and a flower for your pet's collar! Now Specializing in Hats for Cancer Patients! 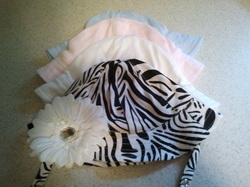 Little Diva Bowtique, LLC specializes in one of a kind hair accessories fitting newborn to adult. We are known for our large variety of unique interchangeable accessories that can be mixed and matched with our crochet and knit hats and headbands. Wear the accessories with the headbands and hats or wear them alone as a hair clip. They can also be put on shirts, handbags, sandals, etc. We are now linked with PAYPAL now easier to order online! Please email us at littledivabowtiquellc@yahoo.com to inquire about any of our products, place an order, or to set up a time to come and take a peek! We'd love to see your pictures and hear your comments! Check out my blog at http://littledivabowtiquellc.blogspot.com/!